Opposites become astonishingly compatible when brought together by the talented and creative minds at Poland's famous Akademia Fryzjerstwa Berendowicz & Kublin. 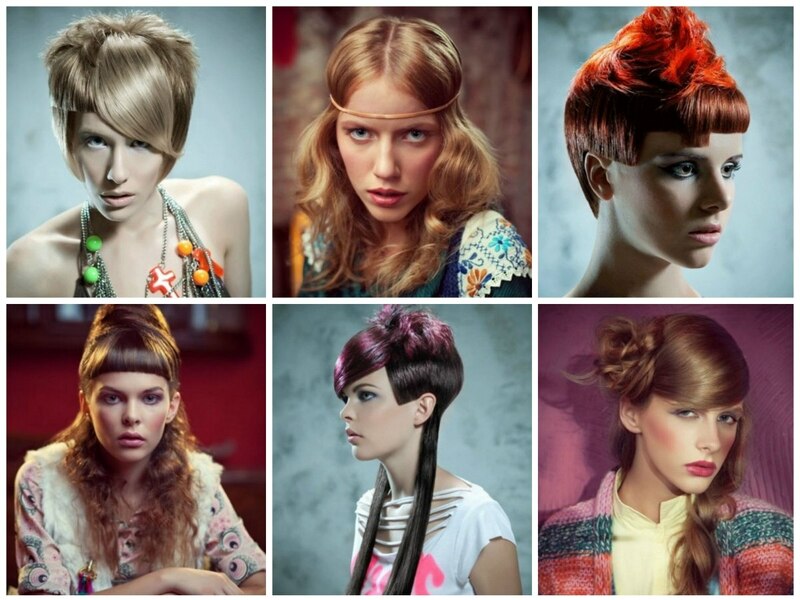 The 1960s and rock music set the mood and inspiration for this colorful and fun hairstyles collection. Half of the collection amuses and amazes with its colorful effects, the clear geometric lines and disruptions thereof. 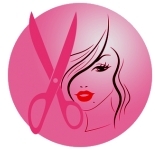 Short haircuts with surprises and extravagant elements that are sure to earn a standing ovation from anyone who looks at hair as a medium for art and who thinks outside the box of tradition. The second part of the fun hairstyles collection reflects the same source of inspiration but is executed in a more traditional way with natural colors and more classic shapes. Rock and Romance are translated into hair in a truly masterful way. The base cut keeps its round and sleek shape through the meticulously cut fine layers that keep the hair close to the scalp while adding the chic form. One of the highlights is definitely the abstract lines that outline this fun haircut. The short fringe, gently rounded, features a narrow and straight peek-a-boo section and the top is literally crowned by a swirl of bright, flaming red hair that stands in a curious contrast to the maroon base - in texture and movement as well as in intensity of color. Textures, different lengths and colors are choreographed to work as one in this short-long and very dimensional haircut that hits on all of our senses. Straight lines with geometric perfection interact with wild and unruly texture on the crown. The fringe is especially thick and guided to the side in the shape of a large, iridescent leaf. The amazing cutting abilities show with the rounded back that seamlessly transforms into long, straight and blunt sections. The Akademia Fryzjerstwa Berendowicz & Kublin gives the art of layering in haircuts a new dimension and definition. They layer hair in clearly separated sections each one of which has its own texture or special characteristics that set it apart from the others. Here the crown is gently tousled and free while the rest of the hair is finely combed into place and held there through the perfect cutting technique and also a bit of product. 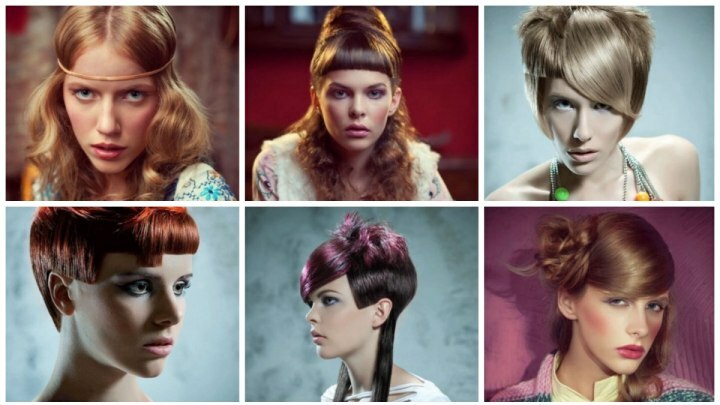 The long fringe with a pointed tip and the head hugging sides incorporate a fun wink to 1960s fashion. Free and easy hairstyle with the iconic headband of the 60s. The obligatory center part is not missing either, just as the gentle bulge and dip on top and below the band. The hair is long - it reaches below the shoulder and collarbone - and of a silken disposition. The wave looks absolutely natural in its casual flow and the color is taken right out of a honey jar with a few sprinkles of golden sunlight. Recycling is not just popular with nature conscious people, but also in the world of hair fashion. This style combines famous looks of various decades. Long casual waves reminiscent of happy hippy times, a high updo with a hint of 1950s beehive and the short blunt fringe that gives so many modern, geometric cuts their character come together in golden brown harmony. Long braids always have a timeless and attractive wholesome character. The peasant look comes and goes in the world of fashion, but it never fully disappears. Here the woven strands of long hair underwent a modern makeover and present themselves in a more and less deconstructed form. A fun idea is to play with possibilities and asymmetry, like having one pigtail braid hanging down and the other coiled up on the side or to coil both only halfway and show of some of those long and wavy locks.